Many professional property developers use a strategy called “land banking” to stack the odds in their favour, so let’s take a look at what’s involved. 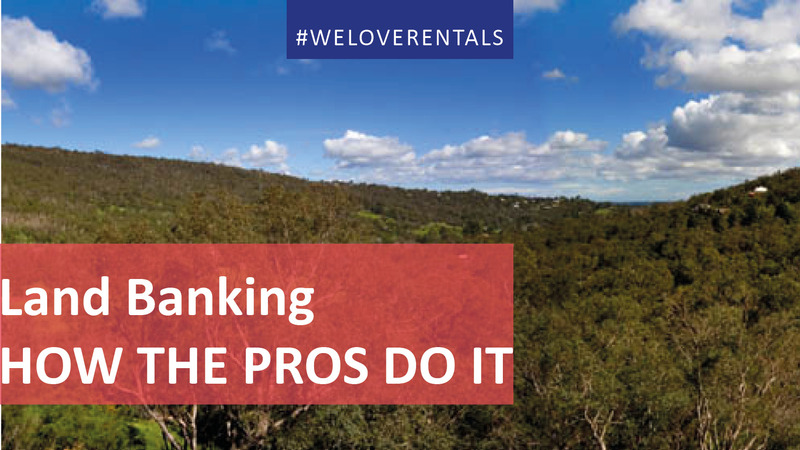 Land banking is simply the process of securing future property development sites today, at the current price. Many large property development companies buy Greenfield sites, farms or large parcels of land and put them in their “land bank” to ensure they have a sufficient stock of land for future property developments. Over time, they rezone the land, put in the necessary roads and infrastructure, undertake a subdivision and on-sell the individual lots. While holding a bank or stockpile of land has helped many developers make big profits in a rising market, it has also been the downfall of a number prominent developers when real estate values slumped, or rising interest rates blew out holding costs. Can this work for smaller property developers too? One option for the smaller investor is to buy old houses close to their “use by date” on well located blocks of land, with property development potential in top suburbs. The rent you receive partially offsets the holding costs, then you can add value to the site by obtaining property development approval (D.A) and then over time, proceeding with the property development. Why is land banking a good strategy? Land appreciates – we all know that it’s the land component of your property investment that appreciates, so buying a property close to its land value can be a smart strategy. Adding value – by obtaining property development approvals you can add substantial value to a site. Once you obtain a development approval for subdivision or for multiple dwellings, apartments or townhouses, you’ve taken out one element of the property development risk; the council approval process. This makes your site more attractive to developers who may be prepared to pay a premium for it and it gives you the option of selling for a profit, or refinancing and continuing with the property development process. Riding the property cycle – Try to secure potential property development sites in a “soft” market. At these times, completing a project may not be particularly lucrative, so you can buy these sites at a good price. As the market moves on, and it always does, the combination of a stronger market and owning a block of land with a D.A. in a prime position allows you to complete the project and make a substantial profit. This strategy works particularly well in the inner and middle ring suburbs of our capital cities, where there is no vacant land for future development, but there is an increasing demand for new medium density developments from a whole new demographic of smaller households. This includes Gen Y’s starting out in apartments, to DINKS (dual income no kids households); MINGLES (Middle Aged Singles) and Baby Boomers who are downsizing. The combination of the current flat property market, a limited supply of potential property development sites and the future demand for more medium density housing make a perfect recipe for successful land banking. The biggest risk is in relation to what type of project (if any) can fit on the property. There are some properties, in fact many properties, that even if in the right location, don’t make good development sites. Size and dimensions – how big is the site and are the dimensions (length x width) suitable for development? Is it a corner site that allows better subdivision potential? Current dwelling – What is on the land at present, can it be leased while obtaining a D.A? Will there be issues with demolition – e.g. heritage, asbestos? Topography – Is the site flat or does it slope? If so is the slope in the right direction for the natural fall of services (sewerage and drainage) or will pumping be required? Significant trees or obstacles – Are there any significant trees on the property or nature strip that will need to be retained and affect the development? Site Orientation – Which way is the site facing? This has implications for planning (natural light), overshadowing and overlooking (privacy issues with neighbours). Neighbourhood Character – what type of properties are in the neighbourhood and how will this impact on the nature of the proposed development?Are there new developments in the street that could act as a precedent for the proposed project? What type of neighbours are you likely to have? Are they likely to object to a new development in their street? Neighbouring properties – what are their setbacks from the street (may affect the required setback of the new development) and what are their setbacks from your boundaries? Are they single or double storey? Do they have windows facing the proposed new project? All these could affect the size and positioning of your proposed project with regard to overshadowing or impacts on privacy. Utilities: What utilities are available? – Water, electricity, phone and gas? Will they need upgrading? Are there any easements affecting the supply of utilities? Site Accessibility – Will it be easy to access the site for construction? This can be a problem in narrow inner suburban streets. Easements: Are there any easements on the site? Development overlays- are there any flood overlays that affect building heights? Are you a property investor seeking reliable and friendly property management? Call us today on 08 6254 6300 to see what we can offer you.